Viv Biz Club Blog: Do We Need a Compostable Products Association? Kathleen Boylan from the Waste Reduction Store in Canada posed the above question in a recent blog post citing the lack of product stewardship in the compostables industry. The lack of a standard certification for all compostables. Today a variety of certifiers exist across various regional markets, including: The Biodegradable Products Institute (the leading US certifier of compostable products), Cedar Grove (the largest composting facility in the US), OK Compost (the Belgian certification program run by Vincotte), Canada now appears to also be developing its own certification program, and more. The lack of standardized acceptance of compostables across composting facilities. 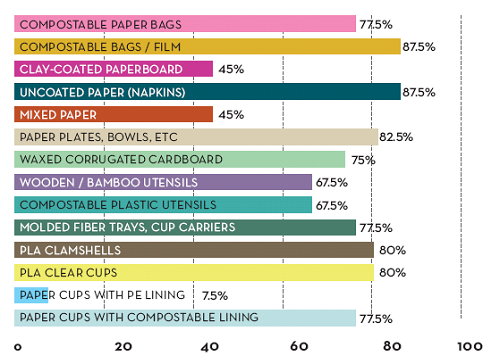 A recent study by the sustainable packaging coalition has found that not all composting facilities that accept food waste accept all compostable food packaging products (see chart on the right that shows the % of facilities that accept a given product if they accept food waste). The green-washing taking place by certain manufacturers who are making false claims that their products are compostable (e.g., Taterware and Georgia Pacific), without providing any compostable certification to support these claims. To address these issues and others, Kathleen’s proposal is that we need a Compostable Products Association to work with 1) compostable product manufacturers, 2) composting facilities, 3) compostable certification programs, and 4) governments to ensure the proper infrastructure and processes are in place so that compostable products are indeed composted. Well, why can’t the Biodegradable Products Institute (BPI), the leading certifier of compostables, perform this function? As we know, the BPI is a certification program that certifies products as compostable according to ASTM standards D-6400 and D-6868. The BPI is a non-profit, but it also makes revenue through its certifications. As such, it has a clear goal of continuing to support itself through the advancement of its logo and certification program. The trouble with having a certification organization operate as the industry association is that they’ll be inherently challenged (and potentially bias) when it comes to working with other certification programs and adopting practices which are best for the industry (which includes the manufacturers, composting facilities, certifications programs, etc) as opposed to just doing what’s best for their certification program. Do we need a Compostable Products Association? Perhaps even an ‘International’Compostable Products Association to ensure that the infrastructure, processes, and standards we’re developing make sense across each of the world’s major marketplaces for compostables. Drop a comment below and tell us what you think.